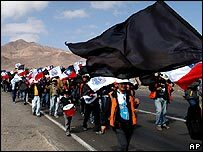 Striking workers at the world's largest copper mine in Chile have broken off negotiations with management after they failed to improve a contract offer. But a spokesman for the mine's owners said talks should resume on Thursday. Output at the Escondida mine, which accounts for 8% of global production, is running at 60% of normal levels. The 2,000 miners have been on strike since Monday and are seeking a 13% wage increase and a bonus of 16m pesos ($29,400; £15,400). The mine's owners have made what they call a final offer of a 3% salary increase, a bonus of 8.5m pesos ($15,600; £8,200) and a 3m peso ($5,500; £2,900) low-interest loan. "We will not resume talks unless the company shows a different stance, a different approach," union official Pedro Marin told the Associated Press news agency on Wednesday. Both sides have said they want to resolve the dispute but they remain far apart on the key issues of salary and bonus payments. BHP Billiton owns 57.5% of the Escondida mine, with Anglo-Australian rival Rio Tinto holding 30%. The remaining equity is controlled mainly by a Japanese-led group, with a small stake in the hands of International Finance Corp. The strike has had an impact on commodity markets, with a prolonged disruption threatening to reduce copper availability worldwide at a time when supplies are already tight. Unions say their pay demand is justified by soaring global copper prices, which have boosted mining profits. But the owners want to protect themselves against any future downturn in prices as the world economy shows signs of slowing down. BHP Billiton has pledged to continue producing as much copper as it can, with contingency plans to keep the mine operational for at least a week. It has declared "force majeure", giving it legal protection and letting it miss contracted agreements, such as deliveries of copper concentrate. The dispute has begun to worry Chile's government, since the mine accounts for more than 2% of the country's annual economic output. 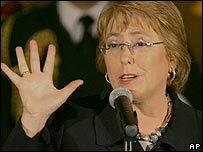 "The only thing I hope for is that this comes to a resolution as soon as possible, hopefully with good results for both sides," said Chilean president Michelle Bachelet during a visit to Ecuador.